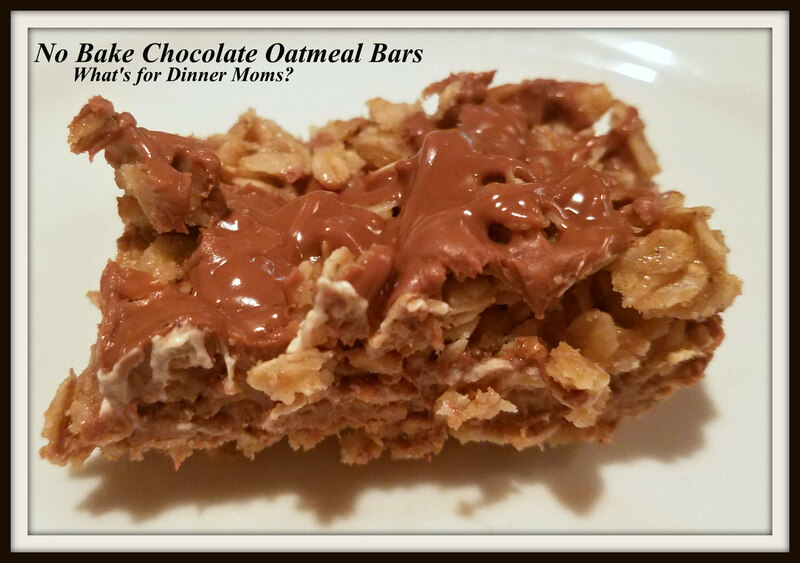 No Bake Chocolate Oatmeal Bars – What's for Dinner Moms? 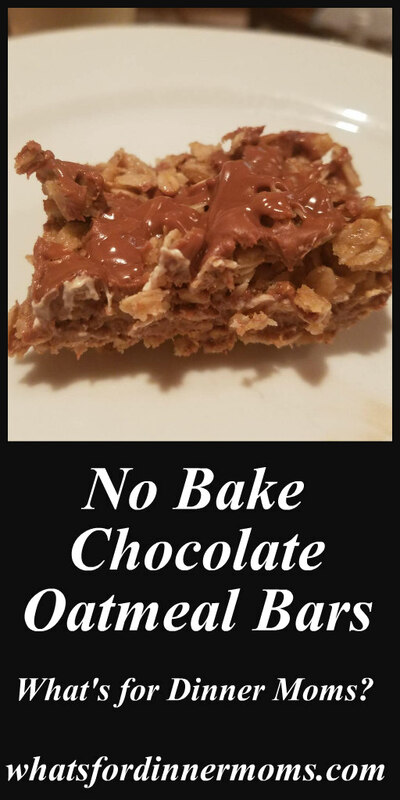 My kids love finding recipes that they can make with their friends for a quick after school snack or a weekend pick-me-up. 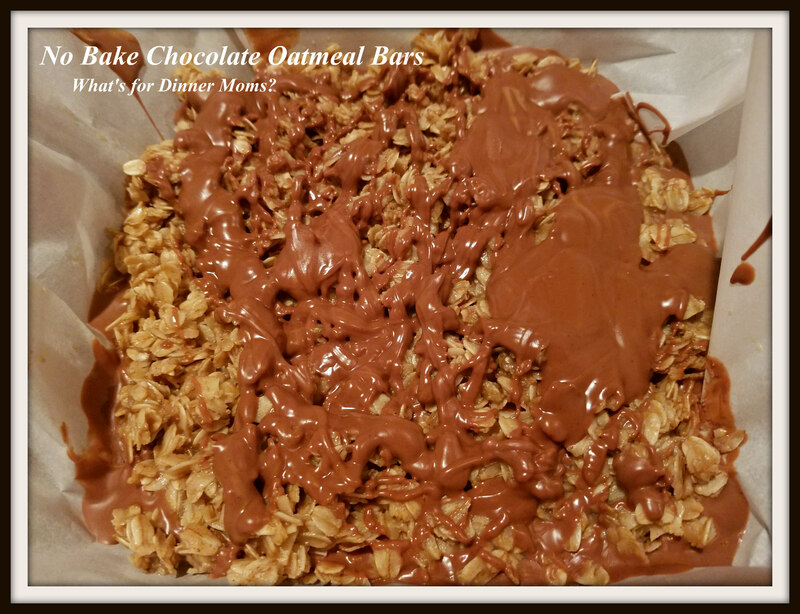 When my daughter saw this recipe she thought for sure this would be a perfect dessert to make with her friends. These only have a bit of cooking and that is on the stove-top and using the microwave. They can easily be made with adult supervision in stirring over the stove. These would be great cookies to teach children how to use the stove with adult supervision and taking hot items from the microwave. The kids definitely enjoyed these far more than I did. They were gone in 1 day. I am NOT a fan of peanut butter and these had a strong peanut butter flavor to them. I kept thinking they were more like a peanut butter cup than a chocolate fudge which was what I was hoping for. All the kids said they would make and eat these again though! Cover an 8 x 8 pan with parchment paper. In a small microwave safe bowl place peanut butter and chocolate chips. Set aside. In a large saucepan melt butter, brown sugar, and vanilla over low heat. Stir until sugar is completely dissolved. Stir in oats, cinnamon, and salt into the butter mixture. Cook mixture for 4-5 minutes. Remove pan from heat. Press 1/2 of the oat mixture into the bottom of the pan with the back of a spoon to create the bottom crust. In a microwave, in 30 second increments, melt the peanut butter and chocolate chips. Stir after each increment until melted. Pour almost all of the chocolate over the bottom crust leaving a bit of chocolate to drizzle on top. Top the chocolate layer with the rest of the oatmeal crust pressing down lightly. Top with a drizzle of chocolate. Allow to cool in refrigerator until ready to cut in approximately 1 hour. Thank you, Sylvester! You too! You’re welcome and I will! Thank you! Hi. this is one recipe that I need to try. I am NOT a peanut butter fan. The rest of my family eats peanut butter spoons for snacks. Literally a spoonful of peanut butter. Ick!